Looking back on a 30-year singing career that saw her develop from alto to mezzo soprano to dramatic soprano, in the process accumulating a repertoire of 100 roles from these three vocal specialisations, Helga Meyer-Wagner never tires of talking about how she’d already loved to sing as a child but only developed a desire to do so professionally more or less by chance, while training to become a music teacher. After graduating from her studies in school music as well as operatic and concertante singing, Meyer-Wagner—already a mother of three—signed an apprentice contract with the Vienna Volksoper. Follow-up engagements took her to numerous opera houses and concert venues across Central Europe such as Landestheater Linz, the Mainfranken Theater in Würzburg, the Vienna State Opera, the Deutsche Oper in Berlin, and the Salzburg and Bregenz Festivals, to name just a few. Beginning in 1990, she actually did start teaching voice alongside her singing career—initially at the acting school of the Vienna Volkstheater. She then went on to teach at the University of Music and Performing Arts Vienna, both at the Department of Voice and Music Theatre and at the Antonio Salieri Department of Vocal Studies and Vocal Research in Music Education, as well as at what is now the Music and Arts University of the City of Vienna. 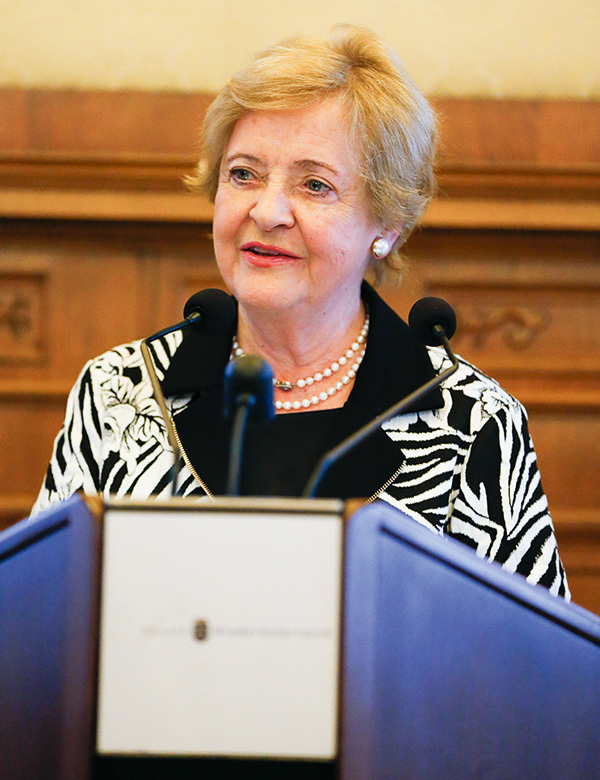 She was awarded the title of professor in 1999, and in 2014 she received the Austrian Cross of Honour for Science and Art. Meyer-Wagner describes what always fuelled her passion for voice teaching with the following words: “To my mind, teaching is an art in its own right. I have to be able to do individualised work with every single person who entrusts him- or herself to me. In my teaching, there’s no general recipe that I could apply to everyone. Once I’ve gotten an impression of the physical and musical abilities and the skill level of someone with whom I’m to work, I provide an honest assessment and try to help raise their level. And if this results in the kind of change I’m looking for, it fuels my ambition to keep developing that talent even further.” A young person should only set out to become a singer in the first place, she says, if they have a great passion for it. And if they also have a desire to pass on the joy they take in this art, viewing it as their highest goal to awaken and encourage people’s enthusiasm for singing and making music together—from the very beginning, including in the choir—then they might also make a good voice teacher. Furthermore, engaging in exchange with other experts and the encouraging communication among voice teachers of all types and levels of training were always important aspects of how she conceived her role as a teacher, and this attitude manifested itself not insignificantly in her many years of service as president of evta Austria, a group that represents the interests of Austrian voice teachers. One could go on and on enumerating the furthertalents and interests of this jubilarian—but assuming that the whole is by no means simplythe sum of all its parts, this would never do justice to Helga Meyer-Wagner in all her versatility. We therefore close by extending our heartfelt congratulations upon this special birthday, along with our best wishes for all future undertakings and projects!